Recommended to: Readers looking for an outside the box read, with original characters. 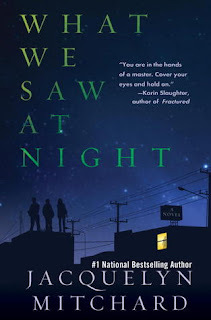 I wanted to read What We Saw At Night as soon as I noticed that it featured parkour. Not just a sport, but a way of life, I've found parkour fascinating since I first heard about it. A discipline that requires the utmost skill and physical prowess, it's amazing to watch people fly across buildings and scale walls with nothing but their hands. I hoped that Jacquelyn Mitchard could take me into this world, and I was excited for it. I wasn't disappointed. It is evident that Mitchard has done her research. She describes parkour beautifully, and pinpoints both the beauty and the danger of it. Allie, Rob, and Juliet are brought together by this lifestyle. I'll admit that this part of the book was what I really enjoyed. The problem I had with this book was the inclusion of XP, and how it became the driving force of the story. It required so much explanation, such a repetition of facts, that I soon started skipping pages to get back to the action. The action picked up again with the inclusion of a murder mystery, and a hidden agenda behind Juliet's behavior. The question of whether or not Allie was in her right mind, and the idea that she might be in danger, pushed the story forward. I'll admit that the suspense factor was a little slow. I think there could have been a few more clues given. However it was a nice addition to the story. Oh, and the ending! I won't spoil, but it's unexpected. Although What We Saw At Night didn't wow me as much as I had hoped, it was definitely an enjoyable read. I can see the prowess with which Jacquelyn Mitchard is able to weave a story. I am intrigued to read more of her writing as soon as possible. If you are interested in parkour, this is a great way to be introduced to the sport. A mystery with friendship as the backdrop, this is a book that will keep you reading to the end.